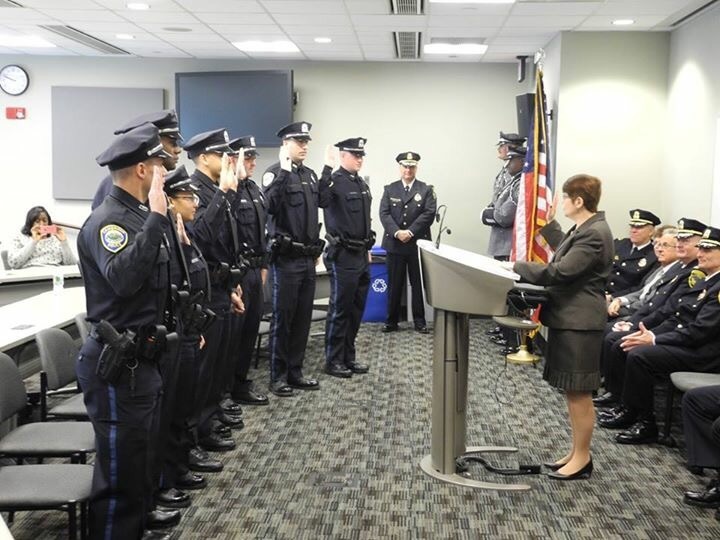 The Cambridge Police Department welcomed eight new police officers to its ranks at a swearing-in ceremony held this week at the Robert W. Healy Public Safety Facility on 125 6th Street. After successfully completing their training at the Lowell Police Academy and graduating last week, Officers Adam Betts, Robert Ciriello, James Costa, Michael LeVecque, Liam McMahon, Alfred Nicotra, Jonathan Vicente, and Brianna Yearwood were sworn in by City Clerk Donna P. Lopez in front of their family and friends. Also in attendance were Mayor David P. Maher, City Manager Richard C. Rossi, Deputy City Manager Lisa C. Peterson, members of City Council, and former and current members of the Cambridge Police Department.